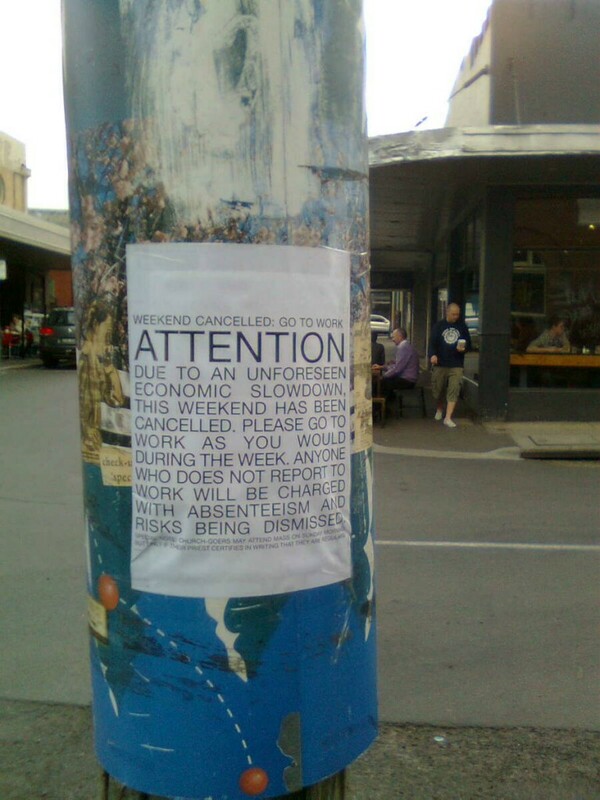 Culture Jamming in my suburb: Weekend Cancelled! Well, sorry, current employer, but I didn’t get the message and here I am out with the dog after her Cartropin injection, heading off to that cafe over there so I can be a (cue sinister music) inner-urban Latte sipper for the next half hour. Well, flat white if you must know. Perhaps you should have backed up the old-skool street posters with some emails and texts. Due to an unforeseen economic slowdown, this weekend has been cancelled. Please go to work as you would during the week. Anyone who does not report to work will be charged with absenteeism and risks being dismissed. Special note: Church goers may attend Mass on Sunday morning, but only if their priest certifies in writing that they are regulars. And just look at all those people in the background ignoring the message! I guess we’ll all get our pink slips on Monday. This message has special resonance for me, as some of my weekends probably will be cancelled in the near future – An IT system which has taken years to build is nearing the go-live date and as a relatively lowly member of the project team, I might be a bit busy over the next few weeks. bless the doggie, the latte, and The Land Of The Long Weekend. …and we saw a little card written next to a basket of eggs that said, ‘boneless chicken’ !